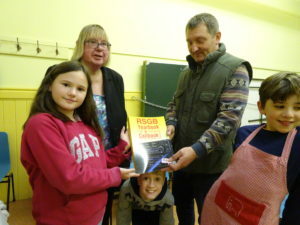 (Pictures of Rally 2017 before people started buying and our RSGB callbook raffle winner presentation). The 2018 Fog on the Tyne Rally will be on Saturday 15th September 2018. This is a bit earlier than previous years. The Fog on the Tyne Radio Rally is run by the Angel of the North Amateur Radio Club (ANARC). This is the largest annual gathering of radio amateurs across Tyneside during the year. For one day only our club takes over the Whitehall Road Methodist Church Hall and we present a market for radios and components. 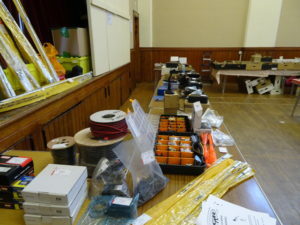 We invite traders from all parts of the UK to set up shop for the day at our club site and we also have a club stall where people can ‘Bring and Buy’ old second-hand equipment. In the spirit of the idea that one person’s junk is someone else’s treasure we also have a ‘junk stall’ where no reasonable offer of purchase is refused. 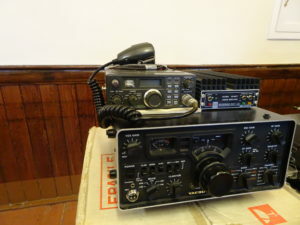 We try to conveniently time the rally to complement other amateur radio events in the north.